A presentation by Roger Rhoads. While postage stamps are small and relatively easy to store, like any other paper product, proper care is necessary for long term preservation. The files here address major issues and identify sources for additional information and a list of archival suppliers. All files are in .pdf format. 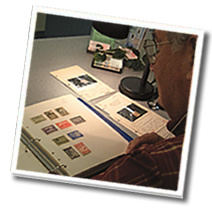 Much of the referenced films and philatelic materials testing was performed and published in the American Philatelist by Dr. William Souder, a former member of this committee. We are very grateful for his work that refutes many previously held opinions. We also wish to express our thanks to the following individuals for the assistance and/or information provided in connection with this project: Wesley L. Boomgaarden, Brian Nelson Burford, Richard A. Colberg, James N. Francis, Thomas J. Homa, Gini Horn, John M. Hotchner, Azeezaly S. Jaffer, John Jonus, Janet R. Klug, Robert E. Lamb, Michael Rogers, Thomas O. Taylor, Ann M. Triggle, Lois Evans-de Violini, and Kathleen Wunderly.